We understand the concerns regarding Americans detained in the DPRK (Democratic People’s Republic of Korea). We acknowledge the inherent dangers and complications of international tourism to the DPRK, and urge would-be tourists to exercise prudence and to follow all applicable laws. At the same time, we wish to inform our representatives of the many, positive things happening in North Korea that are directly related to tourism, and our motivation for proving such services. I (Paul*) have been involved with humanitarian work in North Korea since 2007. I have personally made 17 trips into North Korea, a country of more than 25 million people, in two different capacities: as an NGO worker for a water project which drills wells in villages to access clean water, and while leading tour groups. I have been doing so since 2012 and do the work not for any material gain, but to help improve the situation on the Korean Peninsula. North Korea is not yet open to the point where foreigners can visit on their own terms. A tourist is not going to be able to land in Pyongyang, rent a car, and drive around at their leisure. Tours take place under controlled circumstances, hence groups have official guides, are not allowed to wander off the beaten path, and a preset itinerary is often strictly (yet not always) adhered to. The good news is that, in our experience, tourists are given more latitude every year and North Korea is in the slow process of opening their doors. When visiting, foreigners only get to see pieces of the entire picture. Please understand, however, that this picture is constantly changing. We might not be able to connect with everyone we see, but we connect with many. Today, North Koreans cannot easily travel outside their country. On tours, we are able to see and enter into their culture, but the door swings both ways, as they meet us and encounter ours. We get a glimpse into each other’s lives. For every foreigner who visits North Korea, bringing their culture and ideas, it helps local North Koreans not only to get a better picture of the outside world but to open their country even further. This is the kind of positive engagement no official strategy is currently taking advantage of. Nonetheless, it is happening on the ground and I believe making a significant difference. Today we are also able to do a surprising amount of direct engagement, not only through regular tourism but also sports culture exchanges. I specialize in this type of engagement and headed a project that officially introduced surfing to the country in 2014. Our group made subsequent surfing culture exchange trips in 2015 and 2016. We also engage everyday locals (especially kids) with skiing/snowboarding and skateboarding. Our experience is that this kind of engagement has absolutely made a positive impact in how North Koreans relate to not only foreigners in general but specifically to Americans. Every wave, every smile, every handshake, every kid we get on a surfboard or skateboard, every person we get on skis or a snowboard, every conversation, every high-five is beneficial in breaking down barriers which exist between North Korea and the rest of the world. A YouTube video of a recent trip attracted more than 290,000 views worldwide. It is always gratifying when tour group members find opportunities to engage. Maybe there’s a local riding a bike down the street in Pyongyang or Wonsan and someone from my group tries to get a high-five. It might be awkward, but more often than not, the North Korean local tries to return the high-five. On another occasion one of our groups held a ping-pong tournament with local North Korea surf camp participants. After the tournament finished, we were getting ready to leave and the lady who took care of the room came in to straighten things up. The man who runs our surf camps saw an opportunity to bless this lady, so he asked one of our guides to translate for him. He then thanked the lady for taking care of the room and told her what a great time we had and how much we appreciated her job. He then picked up a vase of plastic flowers from a table, flowers which belonged to the room she took care of, and presented them to her. We wish to inform our representatives that things are slowly opening up, and every year there are more opportunities for engagement. People visiting North Korea should be seen as helping to assist this process. According to North Korean tour guides, not counting Chinese, approximately 5,000 international tourists visit the country annually. To quote Daniel Jasper from American Friends Service Committee: “there is no substitute for the firsthand experience and insights that come from regular interaction and communication.” Even though traveling to North Korea carries risks, those are minimized if we operate within their legal rules and boundaries. The government gives us very strict parameters in which we must operate, and I stress this in my briefings to potential tourists. Since 2012, our tour groups have been blessed to interact with thousands of local people, and we have never left anyone behind. 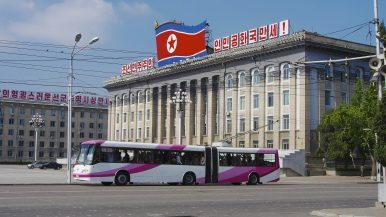 In my travels to North Korea, I have observed countless checkpoints where local citizens are literally asked, “Comrade, papers please!” For most North Koreans, freedom of travel is not something they enjoy as they are required to obtain government permission to travel even to the next town. Our representatives are proposing legislation that would impose a travel ban on American citizens. We understand their good intentions, but freedom of travel is a bedrock American value and Americans have traditionally maintained it despite the dangers. We have only scratched the surface but there is a lot going on in the country that should be supported by the U.S. government as well as the international community. Restricting the travel rights of Americans only serves to keep North Korea in its isolated state as well as violate our freedoms. We — NGO workers and volunteers who have devoted our lives to the people of North Korea — deeply feel the shock and pain of Otto’s tragic death. We grieve for the loss of the young man and pray for the Warmbier family. At the same time, we feel that Otto would have shared our goals and beliefs — that the long, difficult road of helping North Korea open up ultimately benefits both the people there and the world community. By all accounts, Otto was a kindhearted, warm soul, eager to make friends in new places. We have many tourists like Otto, who genuinely wish to make a make a positive, personal impact. We hope that relevant stakeholders learn from the inexplicable tragedy and make all efforts to ensure that international tourists travel safely and follow local guidelines. We cherish Otto’s memory and trust that the people of North Korea will someday do the same. We believe that our representatives can best honor his memory by letting us continue the work of peacefully opening up North Korea. Paul is the pseudonym of an American NGO worker in North Korea. Paul wrote this essay with Joseph Yi, who teaches at Hanyang University. This article was supported by Hanyang University Research Fund.